Crunch & munch your way through tasty granola any time of day. I find it great to have early in the morning for breakfast with a bit of milk or in the afternoon straight from the storage jar as a pick-me-up. The nice thing about homemade granola is that you can control the amount and type of sweetener in your mix; store bought varieties tend to be packed with sugar and syrups. The choices for what to include and what to exclude are numerous to say the least. Perhaps you like a combination of raisins and chocolate chips or one with chopped apricots and pistachios. 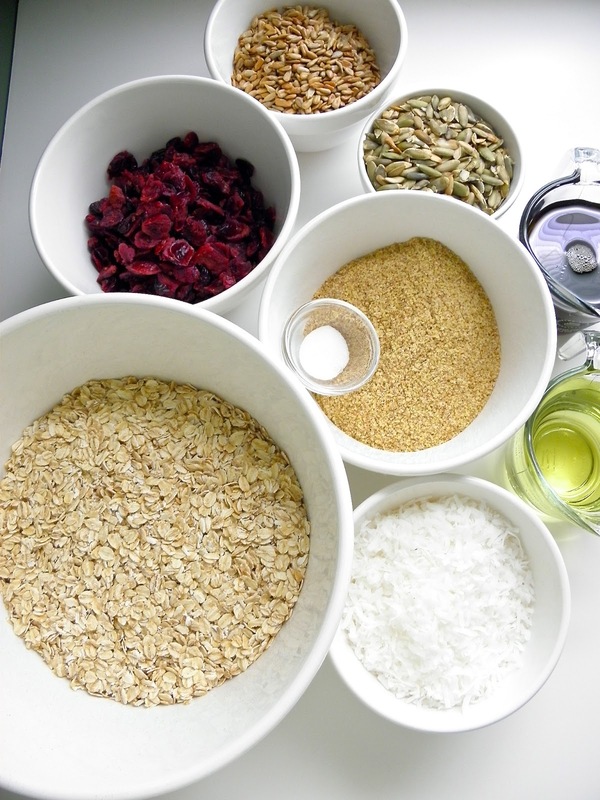 Customizing a homemade granola according to your preferences and those of your family is so easy as long as you choose good ingredients. I love to add cranberries to our granola here at home, because their sweet, plump texture pairs well with the light, crunchy consistency of the toasted oats, nuts and/or seeds. Pure maple syrup with a dark amber color is the first thing I reach for, but honey or even agave nectar could stand in quite easily (a combination of honey & maple syrup is phenomenal). If you’re like me, then you know that combining yogurt with fresh fruits is a good thing. Add some homemade granola and you have a superb breakfast, a part of a healthy lunch or even an afternoon snack. Tangy Greek yogurt makes a great parfait that is truly delectable down to the last spoonful. My Maple Cranberry Granola is a good combination of the things I like to eat. Its flavor is not cloying like those prepackaged types found in supermarkets, but if you prefer a sweeter flavor, add more maple syrup. Keep the granola in your pantry so that you and your family have something good to eat throughout the day. From my home to yours, enjoy it! Note: I like using a dark grade B maple syrup for this type of recipe, because it gives the granola a deeper flavor than grade A. Save the light maple syrups for pancakes, waffles & french toast. Line two rimmed baking sheets (4 baking sheets if making the large quantity) with silpats or parchment paper. In a large bowl, add the old-fashioned oats, wheat germ, unsalted sunflower seeds, raw pumpkin seeds, sweetened flaked coconut and fine sea salt. Mix to combine thoroughly. Add the canola oil and pure maple syrup. Stir to combine completely. Evenly divide the granola between the baking sheets and spread it in a thin layer. Bake the granola for approximately 15-20 minutes. Rotate the baking sheets halfway through baking for even browning. The granola should be a golden color, not excessively brown. Let the granola cool completely on the baking sheet set over a cooling rack. When cool break it up and put it in a large bowl. If you’re making the large quantity recipe, I highly suggest having a bowl that’s at least 7 quarts in capacity. Add the dried cranberries to the cooled, broken up granola and mix thoroughly. The granola can be kept in an airtight jar or container for up to one week in a cool pantry. I love a macchiato every now & then. Make your own healthy parfait for breakfast. This bowl has my homemade granola, Greek yogurt, sliced strawberries, blueberries and chopped apple. It's a good way to start the day! Only you could create granola that looks like a 4th of July party in a bowl! Stunning!! Obviously, your granola is like everything else you create in your kitchen... Made with love, using only the finest ingredients. Meaning... Perfection! Janet, you're TOO kind. You know that I make my things with a lot of love and with the finest ingredients. It really makes a big difference, but then you already know this my friend! You are so right when you say that store bought pre-packaged granola bars have a cloying flavour. The ones I've tried always leave an aftertaste. I'm pretty tempted by your recipe here...perhaps it's the maple syrup! Oh, Paula, the maple syrup is a must! I can't get enough of good quality maple syrup from Vermont or from Canada. I'm going to post a blueberry version soon that is also quite delicious. I used honey & maple syrup in that one.